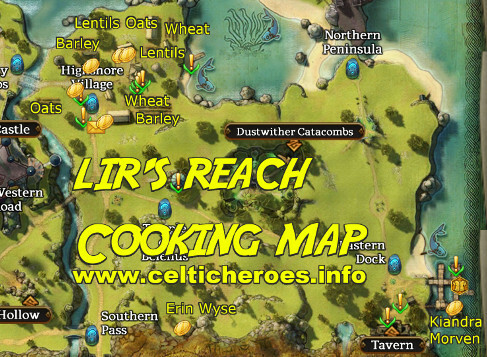 This is the beginning leveling tutorial on the cooking skill in Celtic Heroes. This guide will take you through levels 1 through 170 cooking skill. This guide begins with you having level no cooking experience. This guide does not use any special recipes bought at the bar. This guide assumes only successes, no burns. So you should always use the Extract item purchased at the bar. This guide is what I did to get to leel 170. I did have some leftover items to turn in for the XP quest at the end, so YMMV with respect to the item required numbers I give you. The number of items you have to cook in this guide does not take into account XP gained from the "Bulk Order" repeatable quests. This means the number of items you bake is the upper end of spectrum, and will be the maximum you need to bake. If you want to calculate how many items you need using an XP lix, take the number I've baked and divide it by 4. If the repeatable quest a the bar ever gets you to the next level tier (which it did for me) just skip to the next cooking item that is appropriate for your level. Accept the quest "A Gruelling Task"
Get some Oats from one of the fields near Highshore Village. Accept the quest "More Gruelling Work"
Accept the quest "Flour to Flatbread"
Get some Barley from one of the fields near Highshore Village. Accept the quest "Barley's the grain..."
Cook Flat Bread 11 times for 770 xp. Complete repeatable quest "Bulk Order: Flat Bread!" Turn in 5 Flat Bread to James Fallow at the bar. Repeat until all your Flat Bread is gone. Accept the quest "Making Broth"
Cook Broth (1 Barley, 1 Onion) about 35 times for 5250 xp. Complete repeatable quest "Bulk Order: Broth!" Turn in 5 Broth to James Fallow at the bar. Repeat until all your Broth is gone. Accept the quest "Making Fresh Bread"
Get some Wheat from one of the fields near Highshore Village. Cook Bread (1 Wheat) about 45 times for 11,250 xp. Complete repeatable quest "Bulk Order: Fresh Bread!" Turn in 5 Bread to James Fallow at the bar. Repeat until all your Bread is gone. Accept the quest "Making Lentil Soup"
Get some Lentils from one of the fields near Highshore Village. Cook Lentil Soup (1 Lentil, 1 Onion) about 53 times. Complete repeatable quest "Bulk Order: Lentil Soup!" Turn in 5 Lentil Soup to James Fallow at the bar. Repeat until all your Lentil Soup is gone. Accept the quest "Making Oat Cakes"
Cook Oat Cakes (1 Oats, 1 Butter) about 171 times. To get to level 30 need 171 normal successes for 76,950 xp. Complete repeatable quest "Bulk Order: Oat Cakes!" Turn in 5 Oat Cakes to James Fallow at the bar. Repeat until all your Oat Cakes is gone. Accept the quest "Making Pea Soup"
Cook Pea Soup (1 Lentil, 1 Peas) about 220 times. Needed 220 normal successes for 143,000 xp. Complete repeatable quest "Bulk Order: Pea Soup!" Turn in 5 Pea Soups to James Fallow at the bar. Repeat until all your Pea Soup is gone. Accept the quest "Making Scones"
Cook Scones (1 Barley, 1 Butter) about 252 times. Needed 252 normal successes for 214,200 xp. Complete repeatable quest "Bulk Order: Scones!" Turn in 5 Scones to James Fallow at the bar. Repeat until all your Scones are gone. 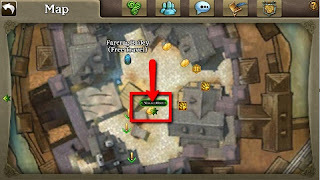 Accept the quest "Making Pottage"
Cook Pottage (1 Oats, 1 Peas, 1 Leek) about 329 times. Needed 329 normal successes for 345,450 xp. Complete repeatable quest "Bulk Order: Pottage!" Turn in 5 Pottage to James Fallow at the bar. Repeat until all your Pottage is gone. Accept the quest "Making Ginger Bread"
Buy Ginger from import goods Kiandra Morven at the Eastern Docs in Lir's Reach. Cook Ginger Bread (1 Wheat, 1 Butter, 1 Ginger) about 393 times. Needed 393 normal successes for 491,250 xp. Complete repeatable quest "Bulk Order: Ginger Bread!" Turn in 5 Ginger Bread to James Fallow at the bar. Repeat until all your Ginger Bread is gone. Accept the quest "Making Scotch Broth"
Buy Peas from the grocer Ian Cresse in the Farcrag Castle Bailey. Buy a Carrot from the grocer Ian Cresse in the Farcrag Castle Bailey. 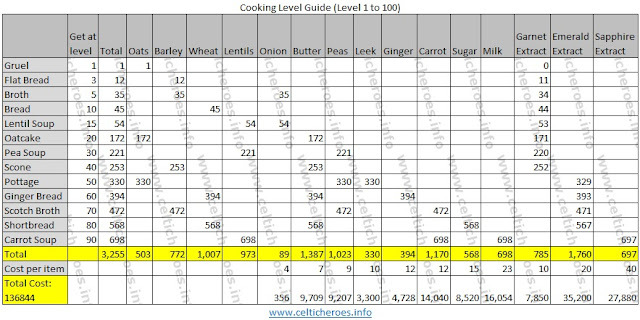 Cook Scotch Broth (1 Barley, 1 Peas, 1 Carrot) about 471 times. Needed 471 normal successes for 682,950 xp. 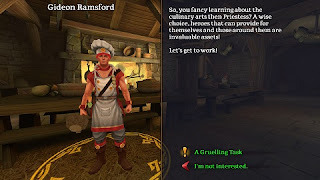 Complete repeatable quest "Bulk Order: Scotch Broth!" Turn in 5 Scotch Broth to James Fallow at the bar. Repeat until all your Scotch Broth is gone. Accept the quest "Making Shortbread"
Buy Sugar from import goods Kiandra Morven at the Eastern Docs in Lir's Reach. Cook Shortbread (1 Wheat, 1 Butter, 1 Sugar) about 567 times. Needed 567 normal successes for 928,954 xp. Complete repeatable quest "Bulk Order: Shortbread!" Turn in 5 Shortbread to James Fallow at the bar. Repeat until all your Shortbread is gone. Accept the quest "Making Carrot Soup"
Cook Carrot Soup (1 Lentils, 1 Milk, 1 Carrot) about 697 times. Complete repeatable quest "Bulk Order: Carrot Soup!" Turn in 5 Carrot Soups to James Fallow at the bar. Repeat until all your Carrot Soup is gone. At this point you should be level 100 in cooking skill. Below is a spreadsheet listing what materials you will need to reach level 100. Now that you're level 100, lets begin the journey to get to level 170. So to begin, go to the tavern kitchen..
Talk to Gideon Ramsford of the Culinarian's Guild in the Tavern kitchen. Accept the quest "Making Pancakes"
Buy Egg from the grocer Erin Wyse in Lir's Reach South Hills. Cook Pancakes (1 Barley, 1 Egg, 1 Sugar) about 300 times for 2050 xp each. Complete repeatable quest "Bulk Order: Pancakes!" Turn in 5 Pancakes to James Fallow at the bar for 20500 xp each. Complete the quest 268 times. If no quest turn-ins, you need 884 normal successes for 1,812,200 xp. Accept the quest "Making Frumenty"
Buy Raisins from import goods Kiandra Morven at the Eastern Docs in Lir's Reach. Cook Frumenty (1 Wheat, 1 Egg, 1 Raisins) about 439 times for 2250 xp each. Complete repeatable quest "Bulk Order: Frumenty!" Turn in 5 Frumenty to James Fallow at the bar for 22500 xp each. Complete the quest 73 times. If no quest turn-ins, you need 1169 normal successes for 2,630,250 xp. Note: Baking 300 got me to just over level 118 with 57 quest completions. Accept the quest "Making Flapjacks"
Buy Butter from the grocer Erin Wyse in Lir's Reach South Hills. Buy Honey from import goods Kiandra Morven at the Eastern Docs in Lir's Reach. Cook Flapjacks (1 Oats, 1 Butter, 1 Honey) about 543 times for 2450 xp each. Complete repeatable quest "Bulk Order: Flapjacks!" Turn in 5 Flapjacks to James Fallow at the bar for 24500 xp each. Complete the quest 95 times. If no quest turn-ins, you need 1590 normal successes for 3,895,500 xp. Accept the quest "Making Sweet Porridge"
Buy Milk from the grocer Erin Wyse in Lir's Reach South Hills. Cook Poridge (1 Oats, 1 Milk, 1 Honey) about 891 times for 2650 xp each. Complete repeatable quest "Bulk Order: Porridge!" Turn in 5 Porridge to James Fallow at the bar for 26,500 xp each. Complete the quest 137 times. If no quest turn-ins, you need 2261 normal successes for 5,991,650 xp. Accept the quest "Making Bannocks"
Completion gives you 210,900 cooking xp. Cook Bannocks (1 Barley, 1 Eggs, 1 Raisins) about 1177 for 2850 xp each. Complete repeatable quest "Bulk Order: Bannocks!" Turn in 5 Bannocks to James Fallow at the bar for 28500 xp each. Complete the quest 216 times. If no quest turn-ins, you need 3337 normal successes for 9,510,450 xp. Accept the quest "Making Mushroom Casserole"
Completion gives you 240,950 cooking xp. Cook Mushroom Casserole (1 Lentils, 1 Milk, 1 King Bolete) about 3065 times for 3050 xp each. Complete repeatable quest "Bulk Order: Mushroom Casserole!" Turn in 5 Mushroom Casseroles to James Fallow at the bar for 30500 xp each. Complete the quest 199 times. If no quest turn-ins, you need 5055 normal successes for 15,417,750 xp. Accept the quest "Making Fruit Cake"
Buy Dried Fruit from import goods Kiandra Morven at the Eastern Docs in Lir's Reach. Completion gives you 273,000 cooking xp. Cook Fruit Cake (1 Wheat, 1 Egg, 1 Dried Fruit) about 5273 times for 3250 xp each. Complete repeatable quest "Bulk Order: Fruit Cake!" Turn in 5 Fruit Cakes to James Fallow at the bar for 32500 xp each. Complete the quest 258 times. If no quest turn-ins, you need 7853 normal successes for 25,522,250 xp. At this point Gideon does not give you new cooking quests. ou are finished with his quest chain. However, he does point you towards Gelebron's Tower, where the cooking bosses reside. They drop rare ingredients and recipes. At this point you should be level 170 in cooking skill. Below is a spreadsheet listing what materials you will need to reach level 170 from level 100. Below is a spreadsheet listing what materials you will need to reach level 170 from level 1. It tells you the amount of XP, the amount of items, and the amount of gold you need to go all the way from level to 170. Click on the image to zoom in if you can't see it well.